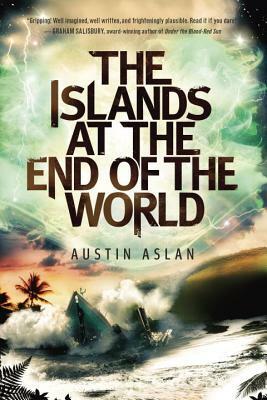 Austin Aslan was inspired to write his debut novel, The Islands at the End of the World, while living on the Big Island of Hawaii. He earned a master’s degree in tropical conservation biology at the University of Hawaii at Hilo. His research on rare Hawaiian plants located on the high slopes of Mauna Loa won him a pair of destroyed hiking boots, a tattered rain jacket, and a National Science Foundation Graduate Research Fellowship. He lives outside Tucson, Arizona, deep in the Sonoran Desert, where he pets scorpions and hugs saguaro cacti with his high-school-sweetheart wife and their two young children. Austin is pursuing a PhD in geography at the University of Arizona and thinking up new stories while conducting ecosystem resilience research atop the Peruvian Andes. He continues to write fiction and looks forward to the publication of this novel’s sequel, The Girl at the Center of the World. “Aslan’s debut is a riveting tale of belonging, family, overcoming perceived limitations, and finding a home."